Feliz Dia de Cinco de Mayo! This is one of the most celebrated holidays by non-Mexicans mostly because who doesn’t want to partake in some amazing queso dip and chips, fun Mariachi band and delicious desserts! Believe it or not, there is more to our country and in the history of Cinco de Mayo! So whether you go all out and celebrate the history or just partake in the food here is a simplified version to the infamous Mexican Tres leches (means 3 milks) cake. You drench this moist cake with: sweet condensed, whole milk, evaporated milk. 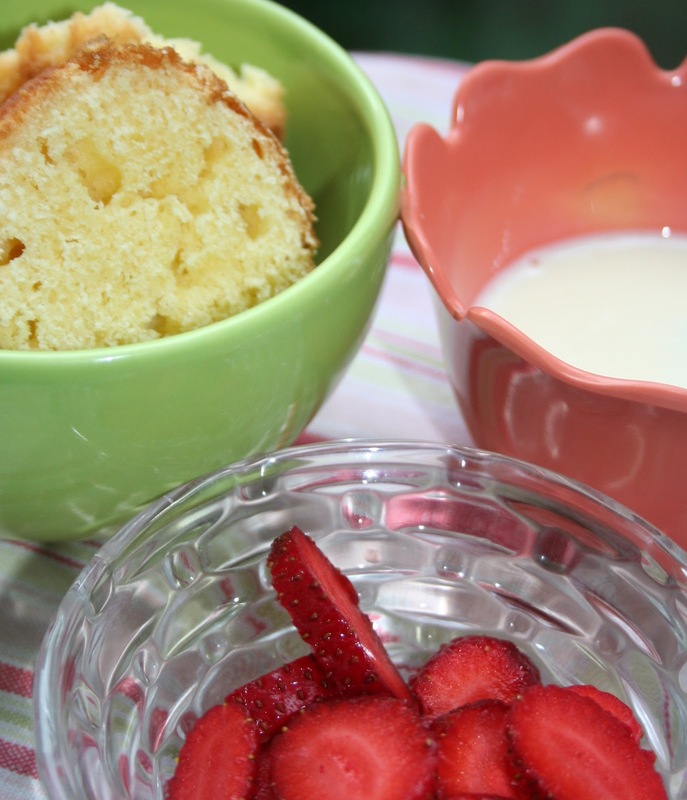 This creates a spongy moist cake that is topped with icing and fruit. A little embarrassing story from my childhood, I grew up eating Tres Leches cake at every Quinceañera or any other big Mexican celebration. I enjoyed eating this yumminess! Mi mami would always ask me to bring her a piece of cake from whatever party I was at that she couldn’t attend. I used to think this was weird and a little embarrassing to have to ask the hostess for a piece of cake for my mom. Later in life, when I worked with newly arrived hispanic immigrants and we would have a party– it never failed, a little boy or girl would ask for a piece of cake for their mother. I was relieved to discover that I was not the only one! Tres Leches Mini Cake, is a recipe I came up with because I love all things simple, especially since I have three growing boys running around mi casa! Another of my favorite simplified Cinco de Mayo favorites is this Healthy and Easy Fried Ice cream Balls! 1. Place the 3 milks in a bowl and mix until the sweet condensed milk is fully mixed in with the other milks. 2. Place cubed cake pieces in cups and pierce the surface of the cake all over with a toothpick. Slowly drizzle all the milk mixture over the top of the cake, making sure to get around the edges of the cake. Don’t be shy you don’t want to end up with a dry Tres Leches Cake that would be the unpardonable sin. 3. Place strawberries in between. 4. Add another layer of pound cake and repeat steps 1 & 2. Allow the cake to absorb the milk mixture. Whip 2 cups of the heavy cream with 3 tablespoons of granulated sugar until thick and stiff peaks form. Spread over the top of each layer and top with a strawberry or cherry. Or you can use whip cream instead of the frosting, which is what I did! Yum. And I have all these in the kitchen already. Including a freshly made pound cake…. Love the individual cake portions, and it sounds and looks so yummy! Thanks for the recipe! My kids are going to love it! Fabulous idea! Quick tres leches cake, yum! I’d love for you to add it on my link party at: http://printabelle.com/?p=4459 Thanks! hi! Fortuitous My girlfriend has discovered inspiredbyfamilymag.com with the page Simplified! Mini Tres Leches Cake | Inspired by FamiliaInspired by Familia. I find the page horny! Unfortunately I’m looking straight for sinful matures. Surf back surely next week.